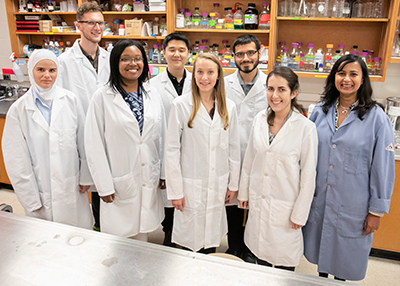 Dr. Aditi Das (at right) in her lab with graduate student research assistants (from left) Asma’a Alkabri, Austin Weigle, Josephine Watson, Justin Kim, Lauren C., William Arnold, and Hannah Huff. Dr. Das has published important findings related to endogenous cannabanoids derived from dietary omega-3 fatty acids. In 2017 her team demonstrated that the body converts omega-3 fatty acids into cannabinoids that have anti-inflammatory benefits similar to cannabinoids found in marijuana, but without the psychoactive effects. 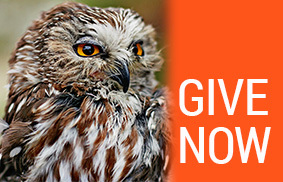 Those findings were published in the Proceedings of the National Academy of Sciences. In 2018, Dr. Das published results showing that these naturally occurring endogenous cannabinoids also fight cancer. “We have a built-in endocannabinoid system which is anti-inflammatory and pain-reducing. Now we see it is also anti-cancer, stopping the cells from proliferating or migrating,” she noted. That work was conducted with cancer researcher Dr. Tim Fan, also a faculty member in the College of Veterinary Medicine. Dr. Das joined the Department of Comparative Biosciences in 2012 after completing a postdoctoral fellowship at the University of Illinois Urbana campus. She completed undergraduate and master’s degrees in her native India and a PhD at Princeton University in Princeton, N.J. Her research focuses on the biochemical mechanism of epoxygenases (enzymes that metabolize polyunsaturated fatty acids into products with a variety of biological functions, and in particular on endocannabinoid metabolism. 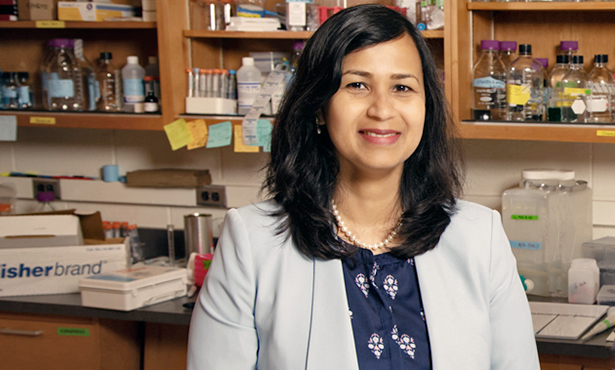 In addition to her faculty appointment in the College of Veterinary Medicine, Dr. Das is an affiliate of the Neuroscience Program, the Department of Biochemistry, the Division of Nutritional Science, the Department of Bioengineering, and the Beckman Institute for Advanced Science and Technology at the University of Illinois. Dr. Das will be honored in June at Nutrition 2019, the annual meeting of ASN, that will unite more than 3,500 researchers, clinical nutritionists, and industry leaders in Baltimore, Md. ASN is a constituent society of the Federation of American Societies for Experimental Biology. The Mary Swartz Rose Young Investigator Award is Supported by the Council for Responsible Nutrition.